Would you like to find out how Triaster tackles the Microsoft Visio and SharePoint challenges? 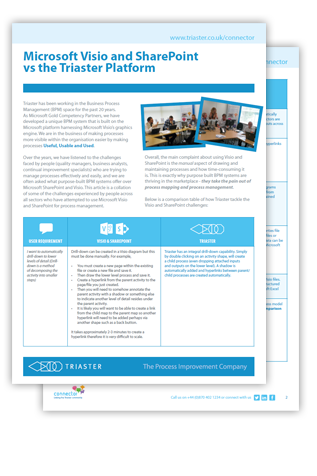 This handy two page comparison report shows the challenges faced when using Microsoft Visio and SharePoint over a purpose-built Business Process Management system and how the Triaster system addresses them. This report is essential if you are considering using Microsoft Visio and SharePoint for business improvement and would like to find out how these systems compare to a purpose-built BPM system like Triaster. If you are looking for a solution to any of the statements below, simply fill out the form on the right to find out how Triaster can make business improvement easy.